Forum Index > Off-topic Talk > Disciplined Army shieldwalls interconnect like lego pieces? Posted: Sat 21 Feb, 2015 9:54 am Post subject: Disciplined Army shieldwalls interconnect like lego pieces? I can't tell you how many times popular portrayals of shieldwall formations by disciplined armies were so well coordinated that they did not have any holes or gaps in them that no arrows can possibly hit a single soldiers in the ranks. In fact disciplined armies such as the Normans are often portrayed as being so interconnected in their wall formations that there is no way for even an opposing army without a shieldwall to inflict casualties. So long as you remain in the wall formation your shield will protact you from any direct blow and the enemy soldiers would have to either break the formation by overwhelming with sheer numbers or hit with weapons strong enough to pierce or smash the shields of individual soldiers.If they can't do that and if they fight otuside a shield formation, you're guaranteed to win with minimal or even no casualties. Pop media portrayals of the Greeks and Romans take this up to eleven in specific film portrayals where the Greek Phalanx and (especially) Roman Tetsudo are done with such coordination and discipline that they LITERALLY CONNECT like Lego pieces! The opening scene from Gladiators where Roman legions battle Germaic barbarians exemplifies just how "perfectly" connecting the Roman Tetsudo is portrayed in movies and shieldwalls are in mass media in general. Not a single gap enemy arrows could penetrate and despite the terrains Romans were able to hold a near perfect front wall shield row while on the march. However I was watching a historical reenactment the other day and I was absolutely shocked at just how much gaps there were int he Tetsudo formation just as practised by re-enactorrs. There was so much obvious holes that it looked like even a harpoon could enter the formation without a shield getting int he way and in the reenactment many participants admitted they were hit by arrows despite being in shieldwall. In addition not counting the gaps, the shields did not look like they could connect perfectly like lego toys that is often portrayed in movies. Even when they stop marching and assume defensive position awaiting the barbarian rush the front row don't even look like a wall of shields more like individuals holding their shield outs. Despite attempting to interconnect their shields together as they awaited the Barbarian rush, they looked less like the wall in movies and more like barbarian hordes. Even the shields they wielded looked to bulky to ever "connect perfectly like lego pieces". I actually went and talk to some of the enactors to help me do an experiment in an attempt to imitate the Tetsudo in movies and when I tried to connect my shield to enacters side by side me, it was so damn difficult to literally make them touch each other and in fact the shields were of various sizes it was impossible to keep a symmetrical front row that looked perfect like in films. Even when we did come close to copying placing the shields close together side by side, it was so skimpy trying to copy movie style shieldwalls that we could barely move forward in a march let alone swing our sword or thrust our spear. In fact in some attempts we were even literally touching each other should by shoulder and nd some of us got scratches and scrapes by our weapons and armor parts. We ultimately had to put some distance between our shields to effectively simulate swinging weapons. I know we were just re-enacting but this event made me curious if the Shieldwall was not as fancy looking and perfect protection movies portray. The fact trying to connect it like lego pieces in the front row alone made it so tight we couldn't even march nevermind throw a spear. We even had difficulties getting out of the wall. Rule of thumb? Everything in the movies is WRONG. Embrace that fundamental truth, and your path into historical research will be much happier. Forget everything you've seen on the screen. No, a shieldwall is never perfect protection. Even if it's good, you will not survive by keeping your shield steady and still--it has to move to protect from whatever blow it about to land, simply because any opponent is going to strike where the shield is NOT. Nevertheless, shieldwalls of some sort were the basic infantry formation for thousands of years, simply because they do offer good protection and mutual support. And you can tell who is on what side simply by which way they are facing! The testudo was not intended as an open-field formation, but was generally used only to approach walls or ramparts, where the enemy was above and raining debris on Roman heads. In open battle, Romans (and many other cultures) actually preferred to have a little elbow room, so each man had about 3 feet of space. As you say, with a very tight formation you can't use your weapons effectively! And everyone knew that. 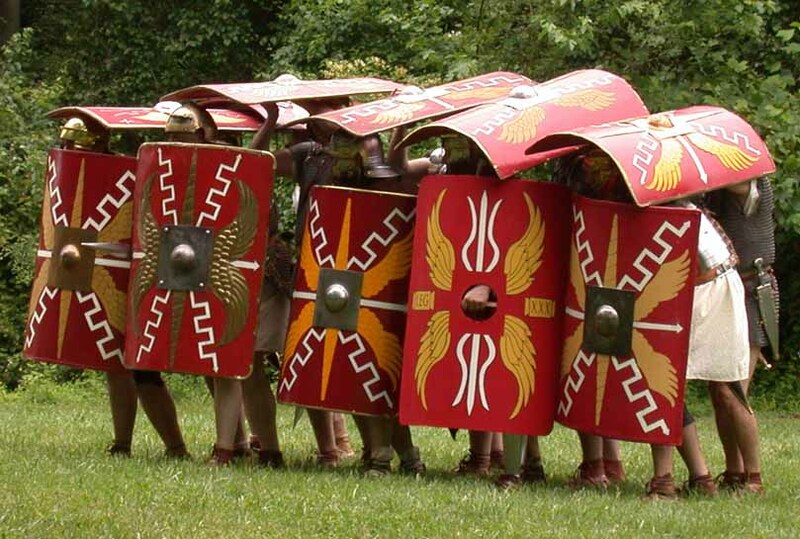 Yes, shields are different size and shapes, even in Roman armies. It doesn't really matter! They still cover pretty well. Part of the problem with your test is that heavy infantry was unlikely to sit still and wait for arrows to slip between shields. They'd charge, and force the archers to run or die. Or they'd use cavalry or light infantry to chase off the archers. Again, none of these are perfect options--it's a battle! Men are going to die. You are at least partly right that it was difficult to wound or kill men who held a good formation. Typically, most of the killing in an ancient battle happened at the end, when one side or the other broke and fled, to be cut down by pursuing victors. Again, not *always*, but often enough that good troops knew their best chance to survive was to stay in formation, whether they were winning or losing.